EM-1, EM-A, EM-X — what’s the difference? 12 Comments on EM-1, EM-A, EM-X — what’s the difference? EM-1 to the left, the mother culture in other words. And to the right, A+, which is the label used here on the Swedish version for molasses. When I first started with EM and Bokashi some seven years ago, I have to admit I was confused. EM: short for Effective Microorganisms, that much I got. But all the other EM-this and EM-that? Some you could make, some you should buy, some you should dilute, some you should use immediately, others not. Took a while to get a grip on it. Here’s an attempt to explain it. There is only one core product in the whole EM world, and that is EM-1. The “1” representing it being the base product. See it as the mother culture, the original microbe preparation from which all other EM products are made. EM is not something you can make yourself. Whatever you might find on the net, it’s a specialized group of microorganisms made to a strict “recipe” in EM labs around the world. (And there’s far more to it than what you can achieve by boiling up some rice and milk). Usually EM-1 is sold in plastic bottles to consumers like us, there’s now an EM factory in almost every country. For agricultural and industrial applications it’s sold in drums or tanks. The thing with EM-1 though is that the microbes are in a dormant state. Not especially effective. To get them up and running you have to activate them, and there’s three basic ways of doing that: all involve sugar. The first is to make Bokashi bran. This is the ideal way to go if you’re working with food waste as the bran is easy to handle (the bran has no value of it’s own, but is a practical carrier and gives the microbes somewhere to live). The process involves combining EM-1, molasses, water and bran in the right mix and allowing it to ferment for a few weeks. The bran then swings into action when applied to moist food waste. The second is to make activated EM. Basically the same idea as above but without the bran. Easy to dilute and spray in the garden and indoors for a myriad of purposes. The process involves combining EM-1, molasses and water in a PET bottle (for example) and ferment for a week or so at room temperature. The sugar kicks the microbes into action and they’re ready to go to work wherever they’re sprayed. Usual dilution is 1:100 although there are many variations. The third is to buy ready activated EM. Here in Sweden we have a product called Mikroferm which is sold in bag-in-box form much like a wine cask. It’s basically exactly the same thing as EM-A but more convenient as you don’t have to ferment it yourself and can just squirt out the amount you need. The upside is that it keeps much better in the vacuum-bag environment, a year at least, whereas homemade EM-A is best used within a month. So it’s a matter of choosing what works best for you and going from there. There’s another product in the EM range that is used for health purposes: EM-X (sometimes called EM Gold). This is a refined version of EM which is approved for human consumption and is becoming a valued health drink. 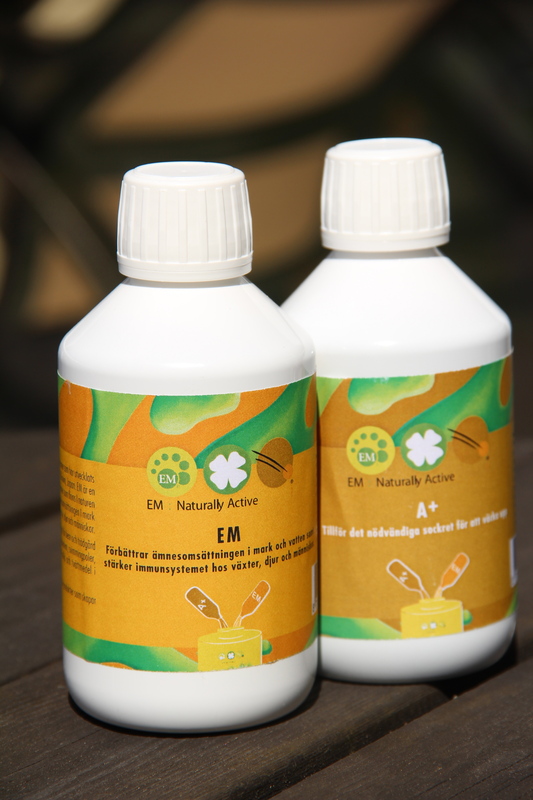 EM-A has long been used as a probiotic in animal husbandry and many individuals also swear by it, but legislation in most countries prevents it being sold for use in this way. EM-X, however, is approved internationally and although expensive is welcomed by many. One more type of liquid EM, and that’s the liquid that comes from your bokashi bucket. Some call it bokashi juice, others bokashi leachate, but basically it’s a fluid concoction of liquid food waste and EM microbes. The exact composition depends on what you have in your bin. Bokashi leachate is famous for its pungent smell (some hate it, others merely find it distasteful…) but as it does wonders for our gardens and indoor plants we just shut up and get on with it. Fortunately the smell blows over pretty fast, so why worry? Like EM-A, bokashi leachate is diluted 1:100 — partly because it’s quite strong, but largely because it’s acidity can give some plants a fright. And like EM-A, it should be used reasonably quickly once diluted, ideally within a day or two. To prevent it oxidizing, I usually drain off my leachate directly into a plastic PET bottle and store in the fridge — my theory is it lasts a few days that way, or at least until I remember to use it up. So that, one way or another, is that: the strange world of EM linguistics. Hope it helped, at least a little. Spray on, enjoy your EM, invent fun things to do with it, and write a few words here if you’ve discovered something that may be helpful to others! Very informative. Thank you Jenny. The leachate is extremely acidic. Rather than put it into a PET bottle, you should put it into a glass bottle, ideally something quite small, like a jam bottle or smaller. Fill it up to the very very top so there is no air in the bottle. If you do not have enough leachate to do this, use water to get it up to the “couldn’t add another drop if I tried” level. Hi Anne. Not sure that I’d risk using glass with anything to do with Bokashi or EM in case there was any ongoing fermentation that could create an overpressure. But I get your point about the leachate being acidic. I usually use the leachate pretty quickly, within a day or two, so the risk of plastic corrosion hasn’t worried me but your point is a good one and is no doubt helpful to others. And the less air in the container the better obviously, from an oxidation point of view, just as long as it doesn’t decide to ferment on you! Hi JennyH, as an organic gardener, I’ve found your article very informative and easy to understand. Thank you for explaining the world of EM so well. I shall be having a go with the leachate on my soil once the weather warms up here in the UK and the growing season kicks off. Hi Gabor, great to hear it helped a bit — it’s not that easy to get a grip on all this stuff in the beginning. We could all use some warmer weather that’s for sure but when it comes there’s a lot of good stuff you can do with EM. Go for it! I would like to do a clarification of your short paragraph about EM-X and EM-X Gold. Of what I have read, there was a dispute that made the original EM-X product/recipe had to be renamed (now called Manju in Germany) and EM-X Gold is a totally different product (that claims to have the same effect as EM-X). Nice articles informative and well written. Not sure what PET bottles are though. Can you explain? PET bottles are just those normal soft plastic drinking bottles, you know the ones all water and soft drinks get sold in. I think PET is a name for the kind of plastic, it’s anyway what it’s called in Europe. The reason they’re better than glass is that sometimes the fermentation process causes an overpressure in the bottle and a plastic bottle can usually deal with this without exploding. Glass is not such a good idea! .. and what is EM- A ? EM-A is activated EM. This is what you use in most applications. The “mother culture” EM-1 is not active as such, it needs to be fermented for a week with molasses and water to become ready to use. This also makes it way, way more cost-effective as well. Thank you Jenny for your great sharing!